I've had a "cake batter" flavor combo on my mind for some time now, with a list of recipes I could try it out on. Then I remembered my Cinnamon Roll Freezer Fudge, and how I've been meaning to come up with a new flavor to share. So, I spent a few minutes in the kitchen, put the two thoughts together, and.... IT WORKED! 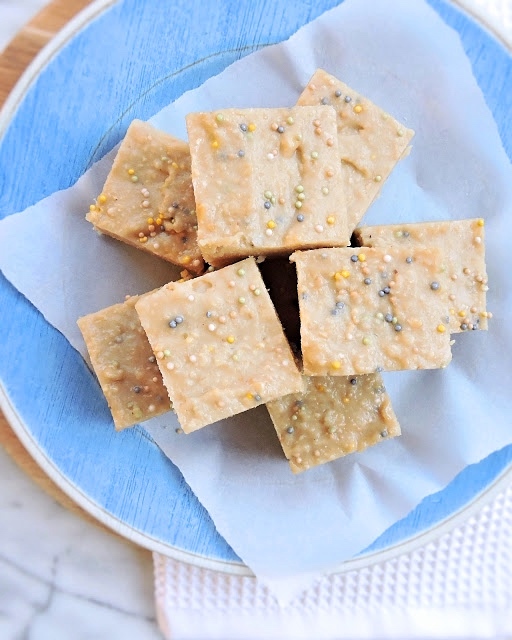 I don't know how else to explain this no-cook, no-bake, Paleo-friendly wonder to you other than: it tastes like vanilla cake batter. Which is a pretty delicious, never-gets-old flavor if I say so myself! We have kept a huge batch on hand in the freezer, which I've snacked on before & after workouts, late at night when I need something sweet, in the morning with coffee, and even while cooking dinner when I'm so starving and just cannot wait. It's so good you guys! The cashews create a perfect fudgy texture, and the ghee just puts this over the edge with the most perfect buttery flavor that you would get from real-deal cake batter. 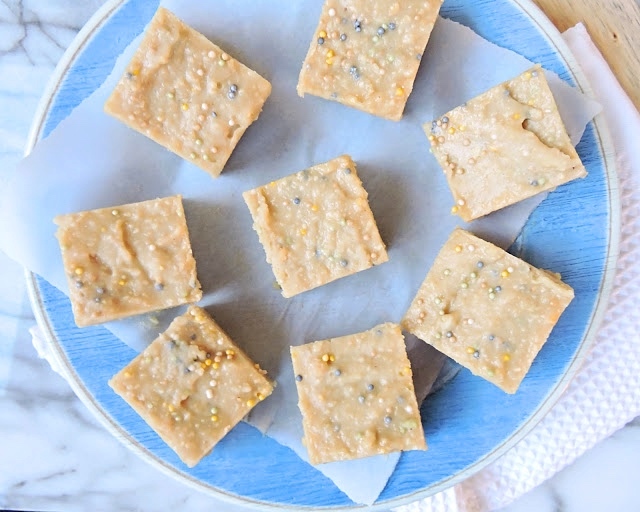 Add sprinkles, like these "Let's Do Organic" Confetti Sprinkelz and the cake batter realness of this creamy fudge cannot be denied! Melt the coconut oil and ghee in a small bowl. To a food processor, add the cashew pieces, protein powder, maple syrup, coconut milk, vanilla, and sea salt. Pour in the melted oil & ghee. Pulse until smooth. Add the sprinkles, and pulse just a couple of times to mix them in. Transfer the mixture to a baking dish lined with parchment paper (mine was 9" x 9"). Add some extra sprinkles, then smooth over the top. Freeze the fudge until firm, about 1 to 2 hours. Use a hot knife to slice into squares (I run my knife under hot water, then dry with a paper towel between each slice). Eat it straight from the freezer, or let it sit out at room temperature for just a minute or two if you want it softer. Enjoy! Butter will work if that's what you have, but ghee really gives it that true cake batter flavor! I like the creamy consistency of coconut milk, but you could use any milk substitute! 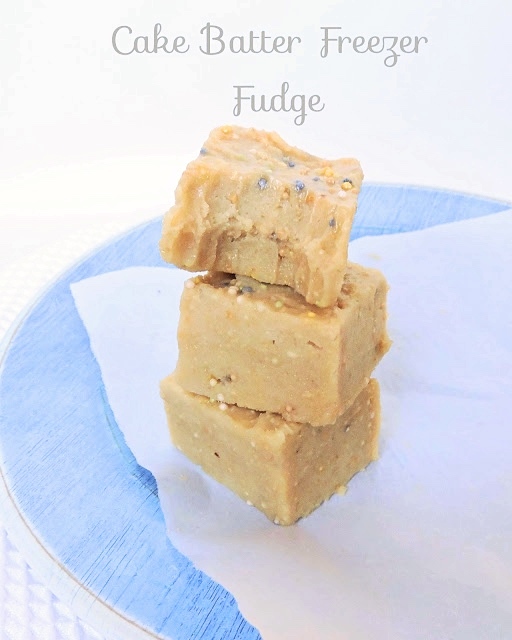 You could easily double this recipe, like I did, for extra thick fudge squares or filling up a larger pan. 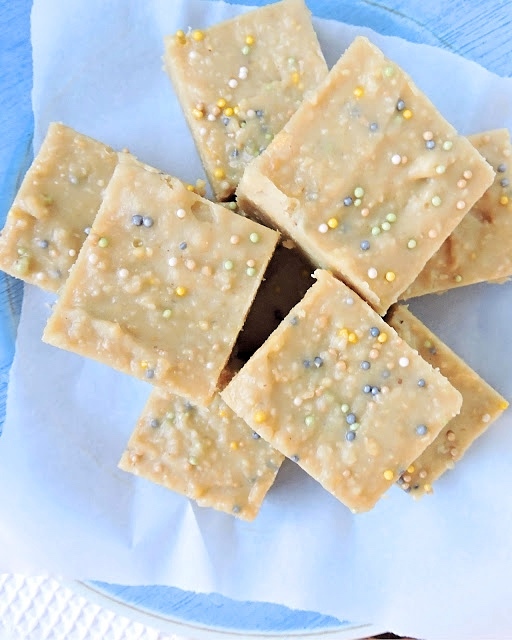 Cake Batter Freezer Fudge is amazing and perfect for any occasion. I am excited and can't wait for the next addition / flavor you create. This sounds amazing! I'm saving this until I replenish my cashew supply. Can't wait to try! Thanks Jen! 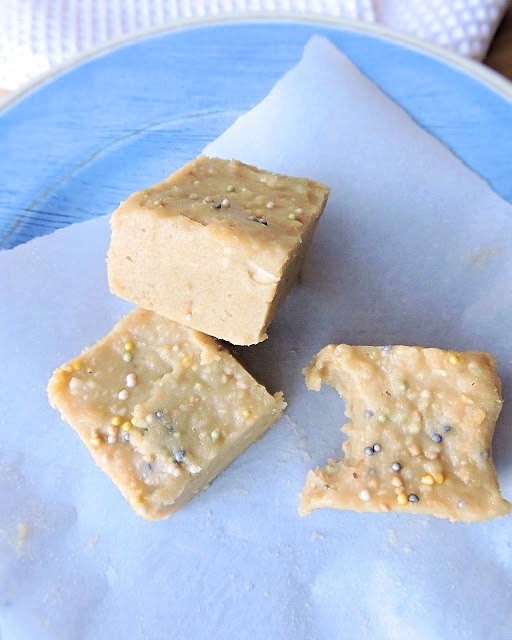 Freezer Fudge is my favorite way by far to use my cashews! So yummy! !